LOGONA Naturkosmetik proudly introduces its new line of natural color cosmetics, continuing the innovative tradition it began 20 years ago. Not only does its new line offer finely nuanced, sophisticated cosmetic options for every look, it does so utilizing the finest ingredients nature has to offer, such as certified organic botanicals, vitamins, and natural colorants. Every product of the new LOGONA cosmetic line fully complies with the rigorous European criteria for certified natural cosmetics. Guaranteed to perform. Guaranteed to benefit your skin. 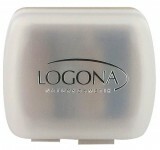 Logona Double Sharpener - 1 pcs.